Salt Farm Texel is a specialist in salt tolerant crops. 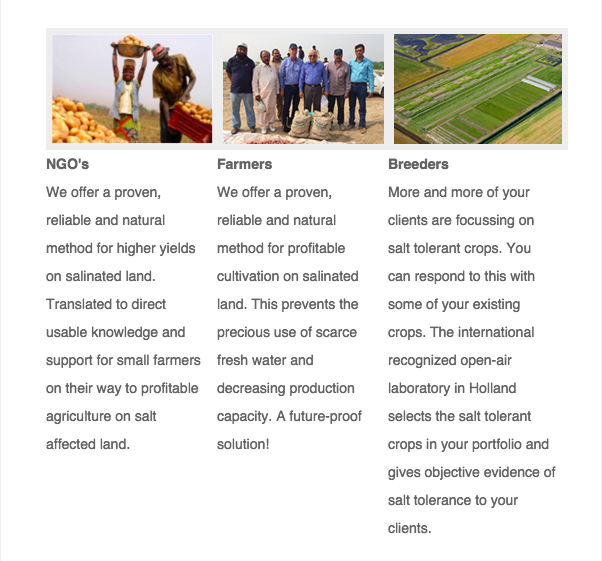 Together with NGO's, farmers and breeders we set up projects in salt affected areas around the world. The usage of less fresh water and feeding the growing population on earth are major topics. We offer a proven, reliable and natural method for higher yields on salinated land. On our hypermodern open-air laboratory in Holland we select salt tolerant crops and we continue the research on more salt tolerant crops and halophytes. We work on practical questions of breeders, agri-chains, seed producers, growers, researchers, governments, waterboards etc. The great demand for salt tolerant seed potato has resulted in the formation of a consortium by the name of Salt Farm Holland Potato that ensures quick action and practical solutions for potato cultivation in many different salt affected areas. Salt Farm Texel provides the knowledge of saline cultivation under field conditions, including crop salt tolerance, (real-time) monitoring of soil salinity and fertilization strategies, the Dutch potato breeders Fobek BV and D. Biemond BV have a wide selection of potato varieties and have focussed on breeding for salt tolerance for many years. The company NewStyle Potatoes BV can supply sufficient amounts of seed potatoes of the highest quality to all corners of the world.